After reaching 1 billion users, Instagram isn’t looking to stop there. 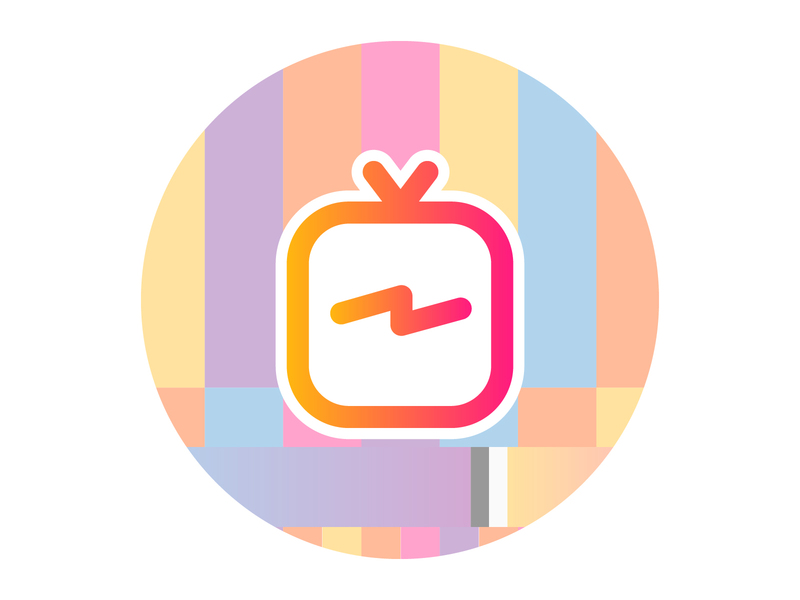 They’ve recently announced a brand new feature to give users more reason to adore the platform: Instagram Television, aka IGTV. Let’s take an in-depth look into IGTV to see all of the new features and how they can benefit you as a consumer and as a business. Rather than being limited to the Instagram app, IGTV will launch as a separate, standalone mobile app on iOS and Android as well. Is this a move by Instagram to challenge YouTube with a video-centric app which sees 1.3 billion users active on the application? IGTV gives all users, not just big-name celebrities, a bunch of new, awesome features to use. Its aim is to allow anyone to become “famous” from IGTV, not just those who already have large audiences. Fun “fact”: If you’re thinking, well aren’t all Instagram features available for everyone, sadly no. 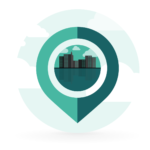 Features like the “swipe up” which sends users to specific links, is only available for those with a big following. Bearing in mind it’s available to all 1 billion Instagrammers, let’s take a look at those important features that we can all starting making use of. As already mentioned, the main promotion for IGTV is that it allows videos that can last for up to 60 minutes to be posted. Instagram’s first foray into video with 15-second clips successfully saw off the threat of Vine, and 60 minutes is still a considerable increase from the 1 minute long videos of more recent years. 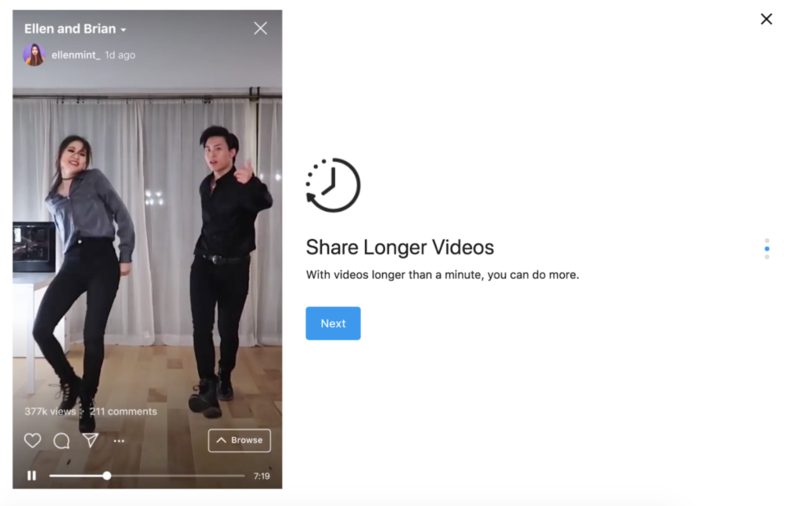 The benefit of sharing longer videos means that users can now see more of a user or brand, giving them more opportunity to connect. 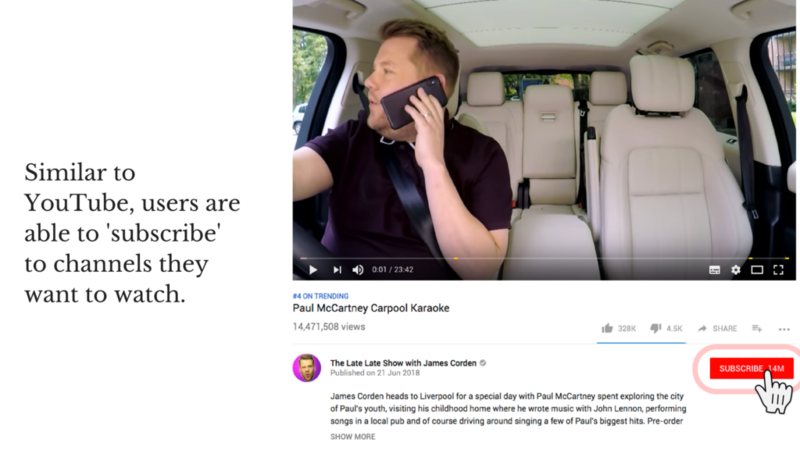 That’s not saying that brands should go out and create hour-long videos thinking this will help them build a relationship with their audience. 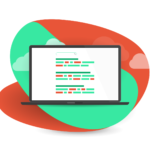 Instead, it means messages that weren’t easily communicated in 1 minute, perhaps business updates or similar, can now be executed in a good 3-5 minutes. Top tip: A great point with video content in general, is to leave the users wanting more. Tease your audience with something intriguing and entertaining to get them hooked. Then, make it relatable and so that they want to “share” with their friends. IGTV will also give creators control to develop their own Instagram Channels full of their different videos which people can “subscribe” to. Sounds familiar? 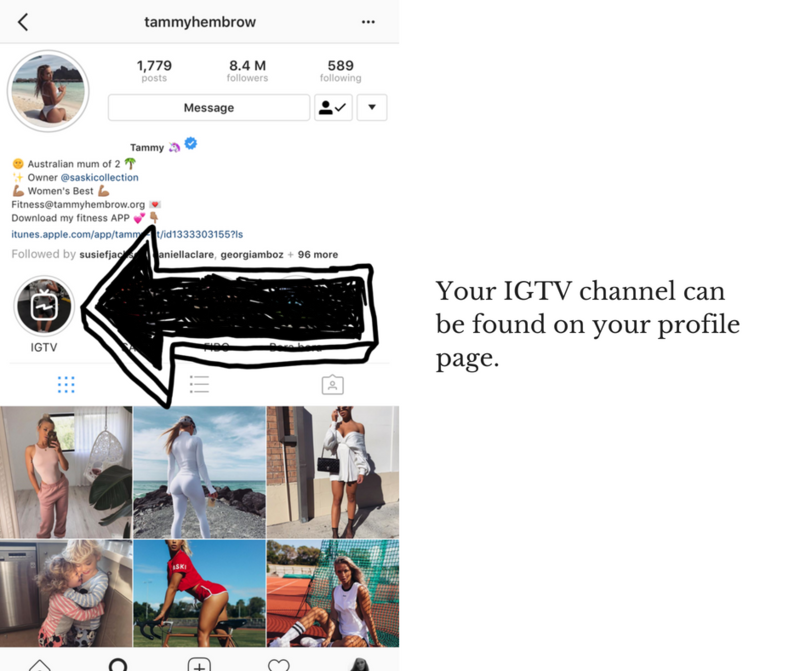 You can easily access a users’ IGTV channel by finding it underneath their author bio on their profile page. This content is slotted before “Story highlights”. 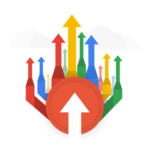 What’s more, you can also add links in the description of your videos to drive traffic elsewhere. 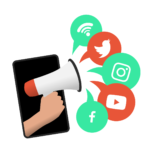 Particularly for businesses, this will prove extremely useful for increasing levels of social awareness of the brand as well as helping to understand what content works best for generating more users to the site. 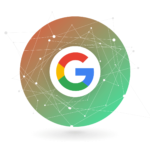 Businesses will be able to experiment targeting traffic to contact pages or better, dedicated landing pages created for specific campaigns. Click to learn more about landing pages vs. homepages. Different to YouTube, IGTV videos automatically start playing when the app opens. Though we’re yet to confirm whether users like this feature, it’s predicted that as it’ll reduce the steps required by the user to watch content, it’ll be well received. Plus a lot of this content shown is by other users that they’re already “following” and hence want to see. They don’t need to take time looking at potential YouTube channels to subscribe to – the hard work is already done for them. Instagram is also using its algorithm to tailor a personalised “For You” section for each individual user, alongside a generic “Popular” and “Continue Watching” feed of video content. 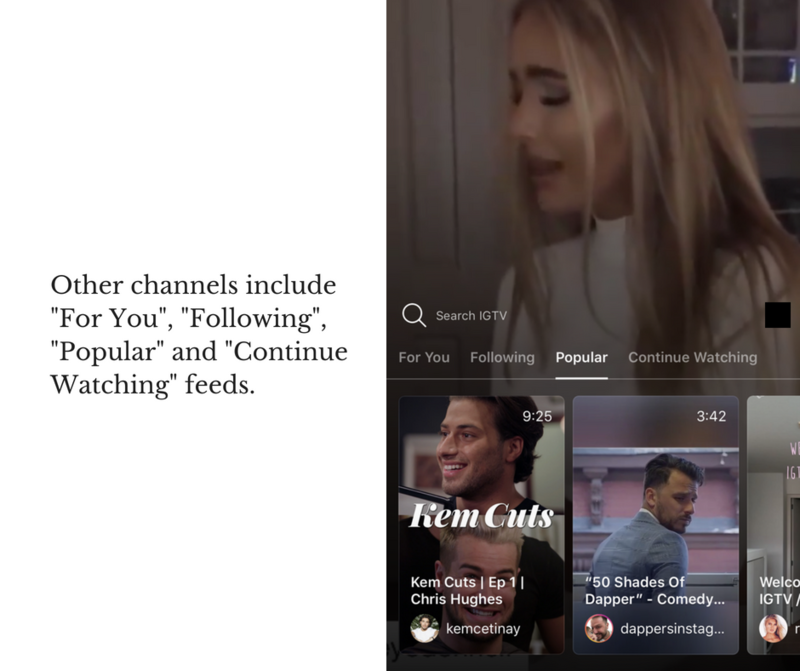 Aside from those channels which you subscribe to, Instagram is using its algorithm to tailor a personalised “For You” section for each individual user, alongside a generic “Popular” and “Continue Watching” feed. Similar to YouTube, one of the key feeds to note is the “Continue Watching”. With IGTV designed for mobile, it’s predicted that users watching content on here are more likely to be on-the-go. Hence they’ll be browsing content one minute and the next will be distracted by something perhaps off their phone or by another app. As a result, the “Continue Watching” tab will give users the flexibility to switch between content. For creators, it means that if someone clicks off their video, it won’t necessarily be the last time they’ll come across it. That way, it echoes the fact Instagram wants everybody’s content to be worthy of “going viral”. 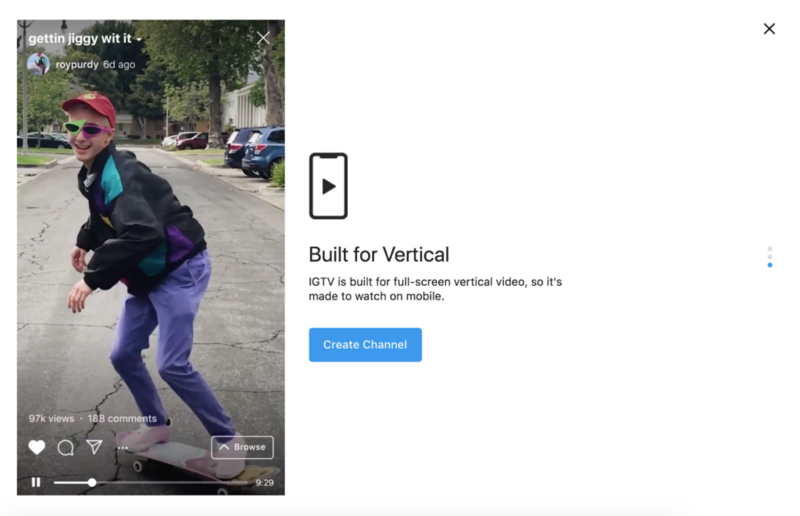 IGTV is built for mobile meaning videos are displayed full screen and vertical. Although great for some, this can be a potential put-off for those who opt for turning their phone to view the video in landscape mode. Something lots of us tend to do. We’re restricted to viewing it solely in the way people naturally hold their phones. The thinking behind it is due to the worldwide growing trends towards being mobile-friendly and the fact the majority of people using Instagram are doing so via their mobile phone. Whether this is a good or bad feature, is determined by individual user preference. What’s yours? Instagram has an audience that skews younger, and is used to watching video on mobile devices. 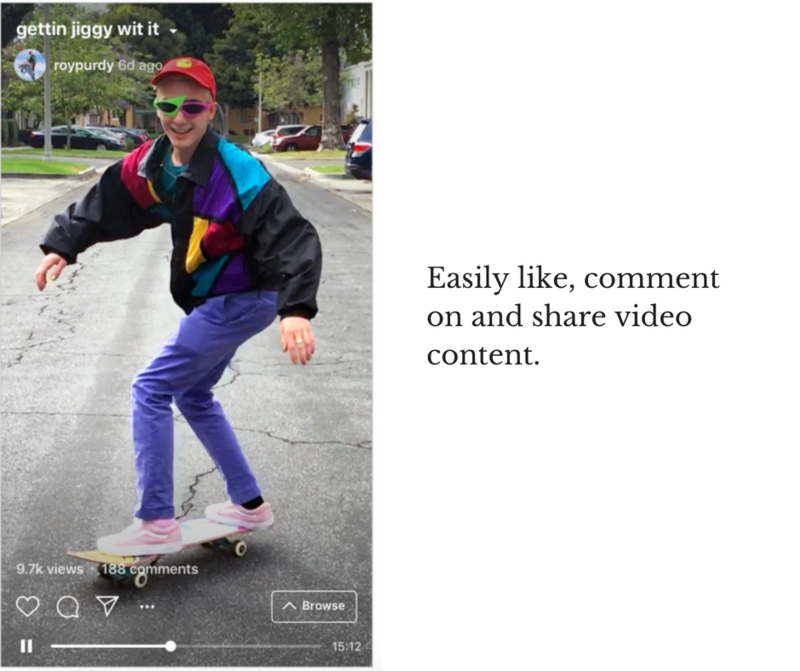 Alike previous Instagram content, you can easily share these longer videos with friends. This can be done using Direct Messaging or through sharing the link to the post. You can also like and comment on the videos. It also tells users and the brands the number of views they’re getting so they can determine how engaging their content is. This can be done by analysing the number of comments and quality of comments, in comparison to impressions. For business profiles, Instagram Insights enables for in-depth analysis of content. Here you can see insights such as view count, the average percentage of video watched and an audience retention graph. Good To Know: To see insights you simply tap open the video, tap the relevant settings icon for your device and then tap View Insights. For more help with IGTV, see here. So far, “there’s no ads in IGTV today,”, however, this is something that’s also deemed as “obviously a very reasonable place [for ads] to end up” states CEO, Kevin Systrom. Instagram is looking into a revenue-sharing deal with partners eventually, but not to start with. IGTV is quite clearly making a poke at YouTube to try and capture the attention of their enormous following. This is by offering them an alternative application to watch videos only with a twist. It’s built in a format that people are perceived to be more inclined to use: mobile. Instagram could become the reliable place to watch something great on the small screen. It has an opportunity to become the TV of mobile. For businesses, IGTV helps advertisers to target particularly younger demographics. This is due to them spending more time on mobile and less time watching television or listening to the radio. For social influencers, it gives them more flexibility when producing longer-lengthened video content. This helps to enhance personal profiles by giving viewers more content to look at in different formats. To understand more about IGTV, watch the feature announcement by CEO Kevin Systrom.